Niacin is an essential vitamin for energy production and maintaining healthy sugar and fat metabolism. It's often used in energy boosting formulas, but in higher doses it has an even more valuable function. High levels of Niacin have been shown to block the breakdown and processing of fats by your body. This decreases bad cholesterol levels and leads to increased levels of good cholesterol. 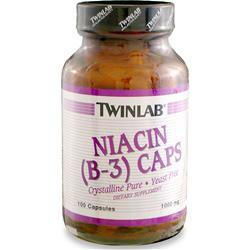 Twinlab Niacin B-3 has 1000mg to improve your cholesterol levels, and keep your heart healthy. One hard gelatin capsule supplies 1000 mg of pure crystalline niacin (vitamin B-3). Capsules: 100's. Other Ingredients: Gelatin, Purified Water, MCT. Definitely causes massive flushing. I took this for a while but ended up throwing the rest away. The flushing was just too much. Switched to flush free which may or may not work as well. These will dilate your capillaries and youre be extremely aware of it for 30 minutes. I have been taking two niacin 1000 mg capsules in the morning and two more with dinner. My old family doctor started me on niacin when I was 16 years old and started smoking. He had me start off with 15 mg and work my way up to 500 mg per pack of smokes. Over the years I have worked my way up to 2000 mg in the morning and another 2000 mg at night. My breathing is better than most 30 year old's, and I have been diagnosed with asbestos in 2002.